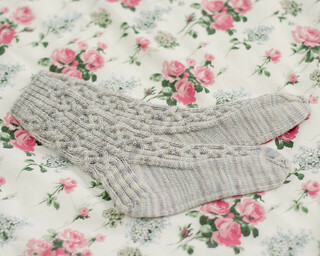 Cabled Socks and Cabled Sweater and Cabled Hat – Hello, Wonderland! I’ve spent years looking for the right pattern for this yarn. I’ve looked at traditional Aran sweaters, modern Aran sweaters, cabled sweaters of varying inspirations, vintage patterns, popular patterns… so many. I didn’t find anything that really caught my attention. I checked out books from the library covering all sorts of cables and Aran and ganseys. One book that I borrowed was Continuous Cables by Melissa Leapman. 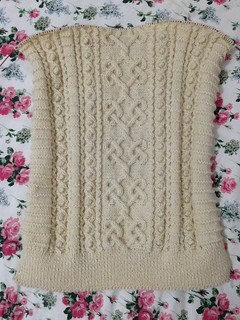 As I paged through it, one pattern really caught my eye–but it was a sweater for children. I favourited the pattern, figuring I could make it for someone’s toddler at a future date, and continued my pattern search. I never found another sweater pattern that I preferred, so I decided to adapt the Child’s Cables and Knots Pullover to an adult size. 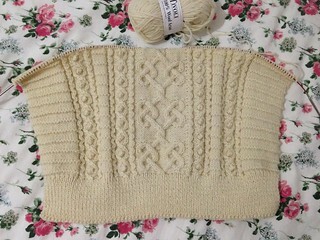 It turns out that modification for this pattern is really easy–I just have to knit the body and sleeves to the correct length. 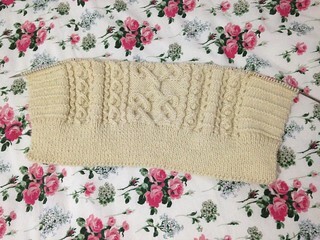 The largest child size requires as many stitches as vintage Aran sweater patterns for a woman’s small–and as I knit it, I can tell it’s not going to be smaller than I am. I brought my sweater with me to the Knit Around the Clock fundraiser at Loopy Yarns on Saturday, April 26, 2014. Knit Around the Clock is a fundraising event for the organization Committed Knitters. Committed Knitters teaches knitting and crochet to women in the Cook County Jail. The volunteers teach and supervise yarn activities in the jail. When the women are released, the program returns to them all of the projects they’ve made during their time in the program–an important detail, because they aren’t allowed to keep those projects (or crafting tools) in the jail during their sentences. A lot of the women use their crafting skills as a tool to help them focus and manage their emotions and lives. It’s a really wonderful program, and I was glad to help out as much as I could by attending the event. I’m hoping to participate next year and improve my fundraising skill! While at the yarn shop I was tempted by a deal on some of my favourite yarn brands, and walked out with two skeins of Madelinetosh A.S.A.P.–a super chunky single–in the “Coquette” colourway. 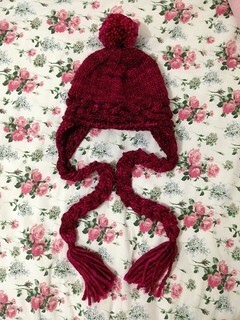 I love the tones, and this vibrant raspberry looked too lovely to leave behind~ It stayed chilly in Chicago until just yesterday; I used the yarn to whip up a quick hat, which was still cold enough to wear for several weeks after finishing the project. It only took me about two days to make, pompoms and tassels included. I wore it to work and my coworkers loved it! 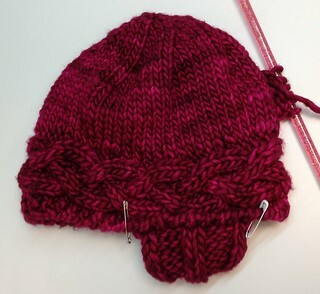 I’d like to add ribbons at the bottoms of the braided “pigtails,” just above the tassels (like the gorgeous example hat), but I’m not sure which colour would coordinate nicely with this hat. It’s so soft and cozy~ I know that when the weather drops in the fall I’m going to be reaching for it right away! The hat was definitely a fun distraction, but now I’m back on my sweater! The back is finished and I’m moving on to the front. 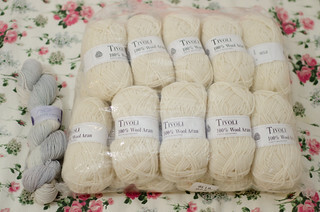 I’m really enjoying the yarn: it’s a discontinued yarn from Tivoli called 100% Wool Aran. It’s not soft, but it has a nice texture to it. It provides excellent stitch definition. I found comments on Ravelry from a few other users who knit sweaters with this yarn, and most seemed very satisfied by the way it held up to laundering and wear, so I’ve got my fingers crossed that I’ll be just as fortunate! This entry was posted in Knitting and tagged Aran, Caoua Coffee, Child's Cables and Knots Pullover, Committed Knitters, finished project, free rapunzel!, hat, Knit Around the Clock 2014, Loopy Yarns, Lorna's Laces, Madelinetosh, Melissa Leapman, Professor Higgins, socks, sweater, Tiny Owl Knits, Tivoli, WIP. Bookmark the permalink. Pingback: 5KCBWDAY7 – Looking Back, Looking Forward | Hello, Wonderland!